​A Seattle, Washington high school history teacher who was pepper-sprayed by police moments after speaking at a Martin Luther King Jr. Day rally is suing the city for $500,000. Attorneys for Jesse Hagopian filed the claim against Seattle on Wednesday, nine days after the incident unfolded during, ironically, an anti-police brutality protest held in tandem with similar rallies across the United States on the holiday named for the slain civil rights leader. Hagopian, a history teacher at Garfield High School who is known throughout the region for his activism, had just finished speaking during the January 19 event and was on the phone with his mother when a female police officer began discharging her pepper spray, striking multiple people. An eyewitness was filming only a few feet away from where that officer and others had formed a barricade along a city intersection as law enforcement tried to control the crowd. A separate video filmed from above suggests that an officer had been knocked off their bicycle down the street, prompting the police to try and clear the area. 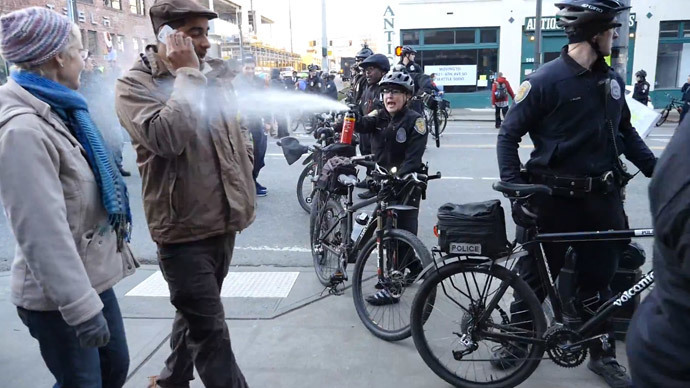 The ground-level footage appears to show Hagopian on the phone, walking towards the sidewalk, when he is blasted across the face with a stream of pepper spray. “Ah, f**k. They just sprayed,”a voice on the video is heard saying as the officer barks to the crowd while attempting to clear the intersection. The close-up video recording of the incident has since been acquired by James Bible, the former president of the Seattle chapter of the NAACP, who in turn posted it to YouTube on Wednesday in concert with the announcement concerning the court filing. Bible is also serving as Hagopian's attorney. According to the Seattle Times, the suit alleges that Hagopian “instantly felt a burning sensation in his eyes and had some difficulty breathing.” The teacher later posted a photograph online showing him trying to tame the effects of the spray by dousing his face with milk. “The main thing I’m upset about is that [I was on] the sidewalk when I was pepper sprayed so there’s really no reason at all they can use to justify what they did,” Hagopian told The Skanner News. If the city does not respond to the tort in 60 days, the network added, the NAACP will file the suit. Ansel Herz, a writer for Seattle’s The Stranger newspaper, wrote that he asked the mayor of Seattle and the city’s police chief for comment, but had not heard back at the time of publishing. "The silence from the Mayor's office and from Chief O'Toole concerning SPD's actions in both the MLK pepper spraying matter, and the false statement in the Wingate matter, is deafening," weighed in Seattle/King County NAACP Economic Chair Sheley Secrest, referring to a separate incident involving the Seattle Police Department earlier that week. "Don't attend an NAACP Black Lives Matter march and rally one day saying that you stand against injustice in Ferguson," Secrest said of Seattle Mayor Ed Murray, according to The Stranger, "and then sit idly by when the truth is revealed that injustice sits squarely in Seattle." Later on Wednesday, the office of Mayor Murray published a statement acknowledging that the city would investigate claims of excessive force during the MLK march. “Under the accountability system that we’ve set up, the uses of force that occurred during the MLK protests are currently under review and being investigated. Moving forward, the City must also continue to implement many other reforms to ensure our officers are adequately trained and prepared to serve and protect all of Seattle’s residents,” Murray said.